Please, beware. Before you blame the magneto or the coil, always first connect the black engine wire to ground, with an clip lead or something equivalent, and disconnect the brown engine wire. This isolates the engine from the rest of the bikes wiring. Usually this will fix the problem of no spark. Usually it’s just a loose brake light/ignition ground wire, often inside the headlight, or unplugged at the brake light switch and unplugged at the brake light (or the brake light filament burned out). Read more in the ignition sections. Welcome to Myrons Mopeds Peugeot Ignition Upgrade tutorial. This is an explanation of how to repair 1976 to 1979 Peugeot two-coil ignitions, with a clear-coated-copper colored lighting coil on the bottom and light golden colored ignition coil on the top. After 1979, Peugeot 103 & 102 mopeds came with a “star” magneto, where several coils are arranged radially like the rays of a star. Those 1980 and later “star” magnetos already have this external transformer upgrade. 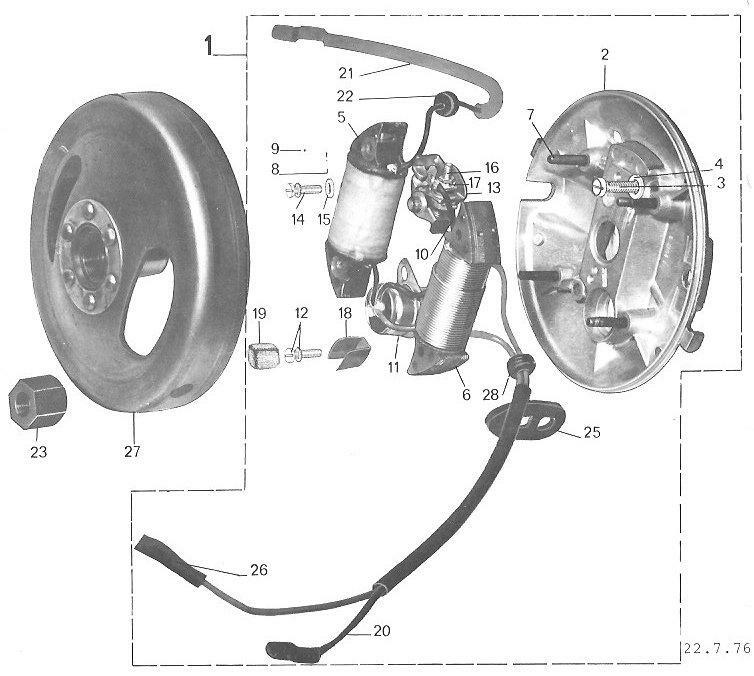 Above is the parts book exploded view of the 1976-79 Peugeot 103 magneto, with external ground (the black wire on top). On the bike, this whole assembly is rotated 80 degrees clockwise. The fingernail-sized notch in #2 stator plate, for the spark plug wire and grommet, should be in the 12 o’clock position, straight up, not in the 9:30 position shown here. Below is the 1980 Peugeot 102/103 magneto, with internal ignition ground, that always has spark no matter what the lights are doing. At bottom is #32, the external transformer, aka “the coil”, that’s bigger and isolated from the engine heat. Both of these Peugeot factory upgrades, internal ignition ground and external transformer coil, made the 1980’s bikes more reliable than the 1970’s models. Most Peugeot 103 mopeds in the USA were the early years 1976 to 1979. In 1981 Cycles Peugeot USA stopped selling motorized bicycles, but continued their main product, bicycles. So the newer magneto/ignitions were in the US for only one year, while the early magneto/ignitions were in the “boom” years. What is a “Upgrade to External Transformer”? All ignitions have a transformer, commonly called “the coil”. The transformer changes the pulses of electricity from low voltage to high voltage. On most mopeds and larger engines, the transformer coil is located outside the engine. On Peugeot, some older mopeds, and most hand-held gardening equipment engines, the transformer is located inside the engine, to save space, weight, and cost. If the high voltage spark plug wire comes from inside the engine, like on a chain saw, then it has an internal transformer. If the spark plug wire comes from outside the engine, then it has an external transformer. 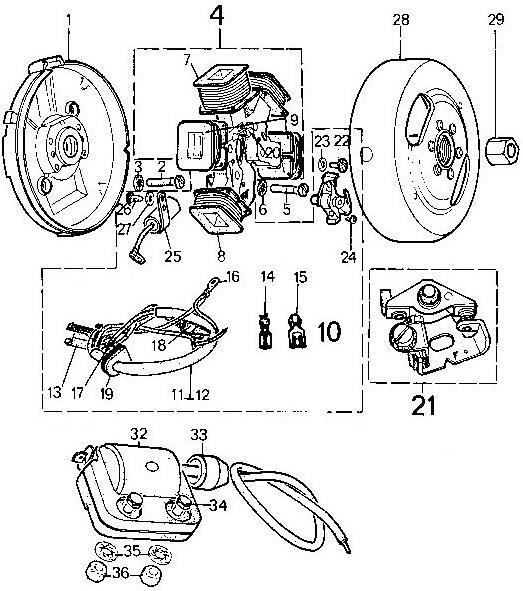 The Peugeot Ignition Upgrade is modifying the internal transformer to work with an external one, and then adding an external transformer (ignition coil), mounted on the frame, just right of the carburetor. Why does it need an upgrade? The original coils go bad, sending sparks that damage the points and condenser, or sparks that jump (arc) through the coil and into the aluminum wall of the stator plate. The result is the engine misfires (hiccups), or worse, spits and sputters chaotically, unpredictably, especially when hot. The cause is tiny cracks in the insulation that let sparks escape. Some old coils go bad this way, by deterioration from old age. Peugeot and certain other “new old stock” coils are no good, because of their age, 35 years old (1977 to 2012). Below is Myrons Mopeds display board, normally hanging above and near the cash register at the shop. It shows the original Peugeot ignition on the left, and the upgraded Peugeot ignition on the right, before and after. Notice that everything is the same, except on the upgrade ignition, (1) the coil has a horizontal cut through it, and (2) the brown (maroon) ignition wire has a “T” with a branch going to the new external ignition coil (red). Those two things are all that’s different. They are easy to say, but not easy to do. At the bottom of the display board is a Peugeot ignition coil (internal transformer) with it’s outer (secondary) windings completely removed, exposing the few hundred inner (primary) windings. The outer windings do not need to be removed completely. Each of the thousands of hair-thin outer (secondary) windings needs to be cut. If too many are left uncut they can still cause some residual misfiring. Below is a close up of the Peugeot ignition coil with it’s outer (secondary) windings removed. Some of them are shown at left, and below embedded in the outer insulation shell. They are hair thin, and clear coated with varnish. Some of the individual hairs are barely visible. 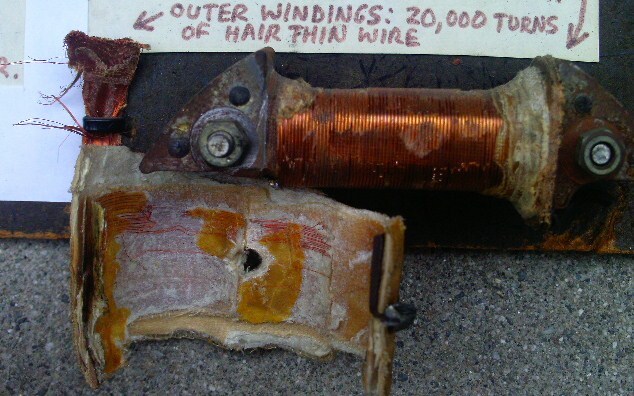 Below is that same coil, showing inner windings even with, or a hair below the first steel plate. What are the symptoms? Very often the points will have a white crust from sparks arcing across. Below left is an example of the white frosting around the outer edge of the round contacts. When the engine is running, the whole magneto might be lit up in blue flickering light from the strong sparks jumping, brighter than the spark plug spark. Normally the points spark a little, but not steady and bright. The sparks that jump the points also damage the condenser. You can’t see the little burnt spots inside the condenser, but they’re there. Another symptom of a bad Peugeot ignition coil is black dots or lines near the high voltage output wire. Below middle and right, are two bad coils with burnt spots on the back side where sparks were escaping. It’s only about 1/2 inch away from the stator plate aluminum wall. When a spark jumps there, it makes the spark plug not fire. Why does it often happen only when fully hot? When solid things get hot they expand slightly. Any microscopic cracks that are closed tight when the engine is cold, will be opened up wide when the engine is fully hot. Open cracks in the insulation are shortcuts for sparks to jump through, or leak out of, instead of going to the spark plug and jumping the gap there. Usually it takes 10 to 20 minutes before a misbehaving Peugeot cuts out and leaves the rider to pedal back home. Once back home and cooled down it might re-start and run fine. 1. Remove the flywheel nut. 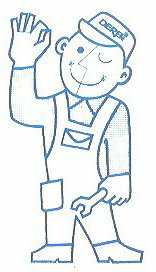 An impact wrench, air or electric is needed, because the flywheel turns with the nut. Or else a piston stop is used in the spark plug hole to stop the piston from rising, and the flywheel from turning. 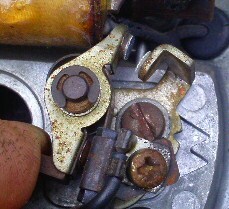 Put oil on the threads before and after removal. 2. Remove the flywheel. There’s no key to locate where it goes (what timing angle) on the crankshaft. A flywheel puller tool pulls on the center threaded hole in the flywheel while a bolt pushes on the crankshaft. 3. Remove the stator assembly. Two slot head screws secure the stationary part of the magneto to the engine case. Check if the threads on the crankshaft got damaged during the flywheel removal, by screwing the M10 x 1.00 flywheel nut on with your fingers. 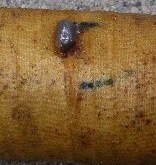 Often the threads are damaged (flared) from the removal and a M10 x 1.00 die is needed to repair the threads. In severe cases, careful grinding and rethreading are needed. That is very difficult/expensive but so is a new crankshaft. 4. Cut through the outer windings. A hand-held disk grinder is what Myrons uses. The cut can and should be wide, so you can see what’s at the bottom. Below left is a coil that is cut to a perfect depth on the sides, but needs more depth in the middle. The perfect depth is the gold colored insulation layer that lies above the inner (thick) windings, and below the outer (thin) windings. Below right is a coil that is cut too deep. It’s only perfect below the P in the word “deep”. 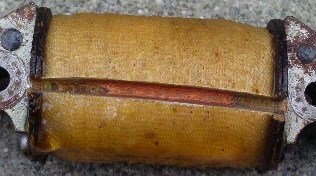 The individual thick windings are visible. Some of the first layer of inner windings is cut through. Also there are cut marks in the steel plate, near the bolt holes. If the cut was made farther away from the bolt holes, either way, then cutting to the depth of the steel plate would not be too deep (because the windings are rounded). Below is a Peugeot coil cut just almost perfect, with only a few outer windings still showing. 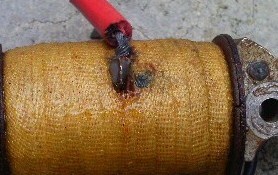 Some lines of gold plastic are visible at the very bottom of the trench, surrounded by the copper of the outer super fine hair thin (invisible) windings. The above example also shows Myrons technique of cutting the coil in place, without removing it. When the cut is just above the 7mm hex M4 nuts, the proper depth is near the level of the steel plate. 5. Replace the condenser. Since the display board was made, Peugeot 20mm condensers have become not available. So the board does not show how an external automotive condenser can replace the original burned out internal one. Any automobile from the 1950’s and 60’s has a suitable condenser. There are different mounts. You must mount it, somehow, onto or near the external ignition coil, which is grounded to the frame. The condenser shell must be grounded solid to the frame. Another “T” can be made from the brown wire, for the external condenser. The original condenser should be removed, and the three wires that went to it all soldered to each other and covered with shrink wrap and positioned so that they never touch or rub against anything, especially the flywheel, and stay there forever. 6. Put the flywheel back on. Clean the crankshaft taper and the flywheel center tapered hole. Clean the points and check them with an ohmeter for continuity, both open and closed. Clean and grease the points cam with high melting point silicone grease, for points. With the spark plug removed, locate top dead center, by feeling the top of the piston with a pen or pencil. While holding the crankshaft at the exact TDC position, place the flywheel on the shaft with the fire mark (line) on the flywheel 7/8 to 1 inch away (toward the front of the bike) from the rubber grommet where the original spark plug wire came out of. While holding both the crankshaft and the flywheel in that position, strike the center rivets of the flywheel with a steel hammer. This will make it “stick” to the tapered crankshaft. 7. Put the flywheel nut back on. In the same way it was removed, either with a piston stop or with an impact wrench, tighten the M10 x 1.00 flywheel nut. Do not hold onto the flywheel, or it might slip and change the timing setting. Once tight, check if the mark on the flywheel is still 7/8 to 1 inch in front of (toward the front wheel) of the mark on the engine (which is the pointer on the black rubber grommet for the original spark plug wire). Once the nut is fully tight (25 ft lbs) the flywheel never slips. 8. Adjust the points. Adjust the points gap until they open on the mark. An ohmeter across brown wire and ground, with the black (ignition ground) wire unplugged, will read near zero when the points are closed and near infinity when they’re open. There are some triangular notches for prying the points by twisting a small flat head screwdriver. The more wider the points gap is, the earlier they open. Too wide a gap means they’ll open before the mark. Too small a gap means they’ll open after the mark. The flywheel rotates clockwise, when viewed from the right side of the bike. As the piston rises, the points are closed. When the piston gets almost at the top, at 1.5mm BTDC, which is about 1 inch along the edge of the 5 inch flywheel, the points open, and the marks line up. Set the points to make that happen and tighten the screw. 9. Install the external coil (and condenser). 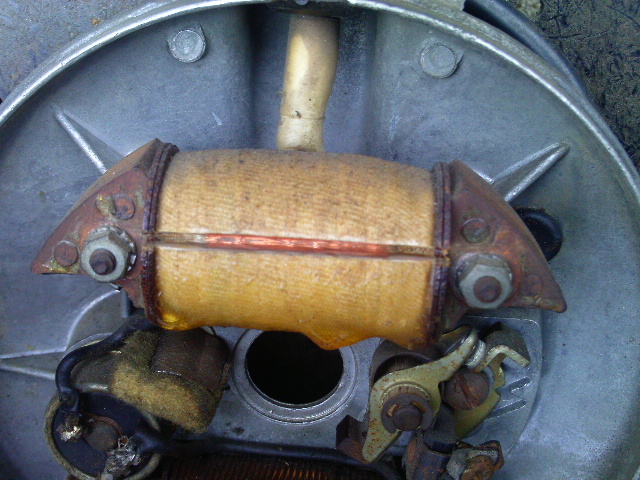 Many (1978-79) Peugeots already have a mounting bracket for the external coil. Some (1976-78) Peugeots do not have any coil mounting bracket. Then one from a Puch, or a custom made bracket, must be welded on exactly right, to barely fit under the right side engine cover. 10. Reconnect the wires and put the spark plug back in. Always ground the black wire if there is no spark. It gets a ground in the left headlight bolt. The ignition ground black wire is often loose there, because tightening the headlight bolt makes the inside locknut looser. Always do this first, way before suspecting somethings wrong in the magneto. If the engine looses spark when idling slow, at the instant the brake is applied, then put in a new NGK B6HS spark plug. If it still does it, reduce the spark plug gap a little. Are there other ways to do it? Yes. Instead of slicing the original coil, a Puch ignition source coil can be used. It must be from a 6-wire 1977-later, with a blue and a blue/black wire, not a 4 or 5-wire 1977-earlier, with only a blue wire. The bolt holes are closer together on Puch, about 52mm instead of Peugeot’s 55mm, but the bolts bend in and still work. The clearance between the stack of steel plates and the flywheel is much more, with the Puch coil, but it still gives a good strong spark. Another way to do it is to swap out the entire magneto for a 1980 “star” magneto, if you can get one, then rewire the brake light the “1980 way”, which is right and left momentary closed switches in parallel, and brake light in series with that, rather than the “1976-79 way”, which is right and left momentary open switches in series, and the brake light in parallel with that. 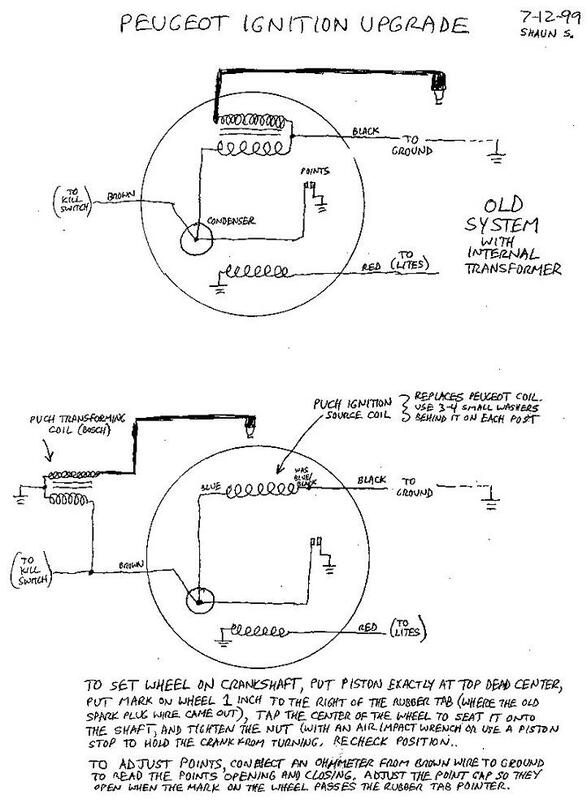 See more in wiring diagrams. What external coils will work? 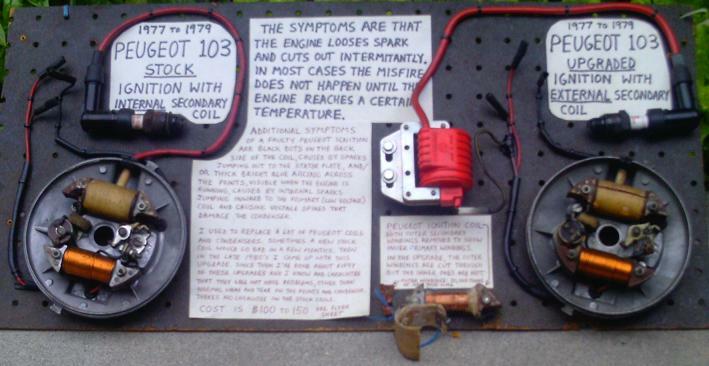 Any 1970’s or older moped or small motorcycle, with magneto and points ignition, external coil will work. More modern 1980’s and later CDI (capacitor discharge ignition) coils are too small. Car coils are too big. The best kind is the Bosch coil (transformer) used on Puch mopeds. The worst are certain generic India or China made ones, with a weaker spark. Where did this idea come from? Starting around 1980, Shaun used to replace a lot of Peugeot condensers, like over 100. Sometimes the points would still have arcing, even with a new condenser. When that happened, 2 or 3 condensers, connected in parallel and externally mounted, were needed to stop the misfiring. Trouble was, the new condenser(s) would not last long. Soon Shaun realized that the Peugeot coils were sending sparks to the new condensers and causing them to “burn out”. When Cycles Peugeot, western USA, moved out of Compton CA, Royal Cyclery bought plenty of new Peugeot coils, like 100, and lots of new complete stator assemblies, like 50. These new original parts lasted into the late 1980’s. By then some of the new coils were bad almost right out of the box. Out of desparation, in about 1988, Shaun got the idea of changing to a different source coil, since all of the Peugeot ones were turning out to be bad. He found that of all the different moped source coils at Royal Cyclery, only the Puch 6-wire one was suitable. All others were either too small, too scarce, or did not have the external ground blue/black wire needed to operate the Peugeot brake light and be compatible with the Peugeot wiring. Gradually through the 1990’s all the Puch source coils got converted to Peugeot upgrade ones. By the late 1990’s there were almost none available. Shaun did about 50 Peugeot Ignition Upgrades from 1988 to 2000 using Puch source coils. Again out of desparation, in the year 2000, he got the idea to use the core of the Peugeot one. He found by trial and error how to cut away the outer windings and re-use the core as a source coil. From 2000 to 2010 Myrons Mopeds has done about 80 Peugeot Ignition Upgrades, recycling the Peugeot coil by cutting it, in place. Now this highly valuable information is free to the public, courtesy of Myrons Mopeds. May your Peugeot 103 never spit, sputter, or say bad things again! You are currently browsing the archives for the Peugeot Ignition Upgrade category.